This year we will be awarding our Champion of the Industry Awards to David Sisson, Senior Vice President, Global Properties of Best Buy for their accomplishments in the retail development field; Jim Camp, Senior Vice President & Regional Development Officer of the Rockefeller Group, for his accomplishments in the industrial development field and Greg McWilliams, Chief Policy Officer of FivePoint Communities, for his accomplishments in the service development field. In addition to the Champions of the Industry award recipients, CBPA is also recognizing two companies for their dedication and commitment to community service and the commercial real estate industry. Wayne Berman, Senior Managing Director and Head of Global Government Affairs of The Blackstone Group will be awarded the John Caldecott Memorial Award for their community charitable actions and Jason Jamison of GM Properties is being awarded the Ernest W. Hahn Memorial Award for Legislative Affairs for their service to the commercial real estate industry. 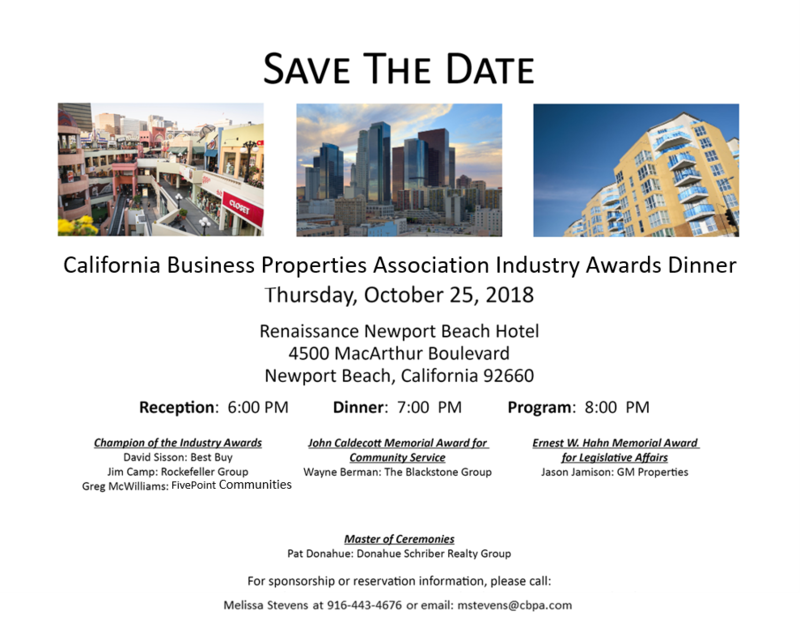 California Business Properties Association Awards Dinner is scheduled for October 25, 2018 at The Renaissance Hotel in Newport Beach. The CBPA Awards Dinner is a chance to recognize the unwavering leadership of individuals and companies dedicated to the commercial industrial retail real estate industry. The Ernest W. Hahn Award, honors our founder’s many contributions to the real estate industry. The award is given to an individual and/or organization that go above and beyond the call of duty to impact legislative, regulatory, or public policy issues on behalf of our industry. The John Caldecott Award, honors the unfaltering lifelong community service provided by John Caldecott through his service in the Salvation Army. The award recognizes an individual and/or organization that advances our industry through community service to others. Champion of the Industry Awards are presented to individuals and/or companies who have dedicated themselves to the improvement of the commercial, industrial, and/or retail real estate industry in California through the development of projects that stand-out for their innovation, attraction, and versatility. Click here for Past Awardees.